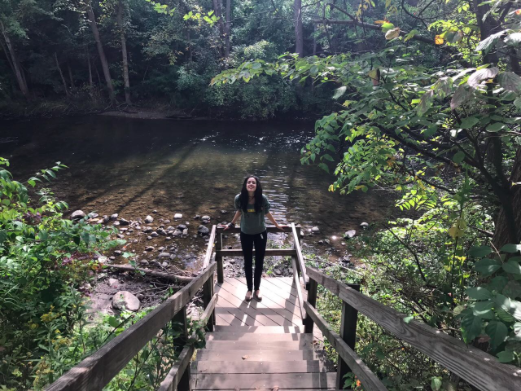 The following post was written by Claudia Molina, an undergraduate student from Brazil studying journalism at Oakland University. The first place I heard about when I moved to OU was Yates Cider Mill. Professors, students, everyone talked about this place… “Best cider and donuts around”, they all said. There are no donuts in Brazil. Why not give it a shot? If you are studying abroad, you will always run toward cultural expressions to try out. If you haven’t been there already, you should go. 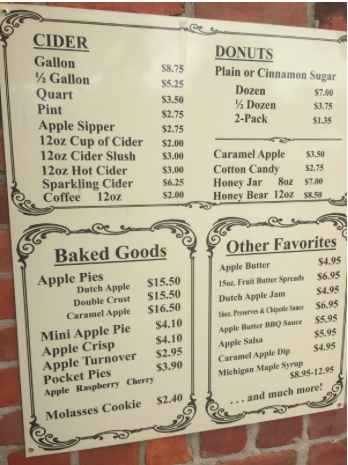 It is always worth it to experience new things, and Yates Cider Mill is definitely worth it! Especially with Spring just around the corner. 2:00 p.m. One day, a couple of friends promised to drive me to Yates after class. It was a short trip of just about 6 miles. The place looks like an authentic American farm with red barns and – depending on the time of the year – real animals that you can pet and feed. It is right by the road and there is a parking lot. It can be hard to park during the busiest hours and during Summer. I went on a Fall afternoon and I got my donut really fast, but there were few people and no pets. It may not be so bad to go when it’s crowded, after all. At Yates they offer many things: fudges, caramel apples, apple pies, cookies… I got their apple cider and a fresh cinnamon sugar donut- everyone’s favorite. Do not regret it! They were fresh and on point. My favorite part of the visit was the landscape. There is a beautiful river that flows right next to the Mill so you can sit and enjoy a really nice view while you eat your donut. You can also go on the Yates trail after eating and capture nice moments with your camera. 4:30 p.m. After that, we went to Great Lakes Crossing Outlet. Even though my home currency is one third the value of a dollar (which is really bad) I still can have a good time there. There are a lot of great stores and interesting sales. I can never resist the smell of Cinnabon or Auntie Anne’s every time I go there. Cinnamon rolls and pretzels are my two ideal mall snacks. To end our Fall evening outing, my friends and I decided to eat at the Rainforest Café. It is a perfect place for kids, but maybe because I’m Brazilian, something about the decoration caught my attention. The restaurant has a forest ambiance, with animals that move and make sounds, real water falling from time to time as if it is raining, and lights that simulate storms. It wasn’t too expensive considering that the dishes were big and, actually, really good. The deserts are fun too, as we all had a Volcano chocolate cake. Perhaps one of the best things about being foreign is that you don’t have any preconceived ideas about anyone or anything. It is almost as if you were a little kid. You have to learn how to talk and you can try things without even thinking if someone will judge you, just because you can. (C) Copyright 2019 International Oasis, Inc. Proudly powered by Wordpress and .